There’s an enormous caveat here: while our projections are based on exposed senior output, we have good reason to think Miles, a 26 year old midfielder, is a lot better than a fringe player likely to wash out. 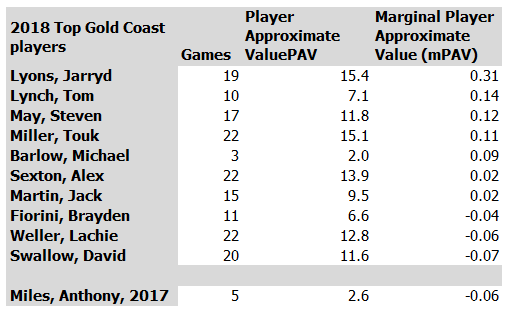 Sorting our 2018 Player Approximate Value data by mPAV (marginal, per game PAV) shows that in his one game in 2018 he ranks third in the league. It was a valuable game he played! With Martin missing against Port Adelaide in round 12, Miles played a similar goal-kicking, inside-50 supplying, clearance-winning midfield role and didn’t actually do a whole lot worse than Dusty himself in those terms. This is before we consider that Miles topped 13.4 PAV in 2016 and 20.2 (!) in 2015. For those playing at home, 20.2 PAVs in a season is elite – but an extreme outlier for Miles’ career to date. All this makes Miles a prime candidate to be one of those players who couldn’t fit into a top side, but who will be successful in a weaker side where he’s clearly going to be best 22. 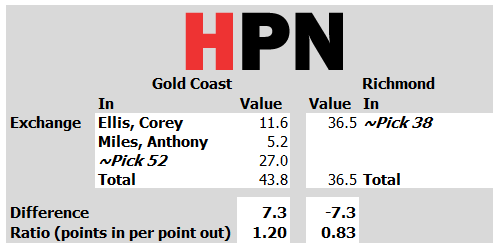 Gold Coast has some success with Witts and Lyons – players who fall into the same category – recently. 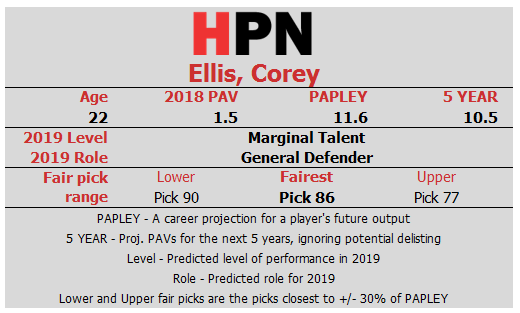 With regards to Ellis, there’s nothing to suggest a similar upside, but as a 22 year old notional small defender is much closer to a blank slate for the Suns. If we assume this trade was part of a tacit agreement linked to Tom Lynch moving to Gold Coast as a free agent, the overall exchange looks rather different. As we discussed last week, the shorter shelf life of free agents in general, plus a shaky recent period of form and injury for Tom Lynch specifically, both mean the career yield of pick 3 is projected to be a lot higher than Lynch’s future value. Even doubling Lynch’s projection so it better aligns with his peak years still isn’t likely to give him as much output as pick 3 will have over its average career. The injection of the compensation pick therefore turns the Tigers and Suns’ exchange into a major win-win. Gold Coast win big. They get pick 3, the output of which projects better than Lynch’s remaining career, and would still do so even if the soon to be 26 year old Lynch is assumed to have much better form and longevity than being projected here. In addition, they get the two players who both may play useful roles as discussed above. 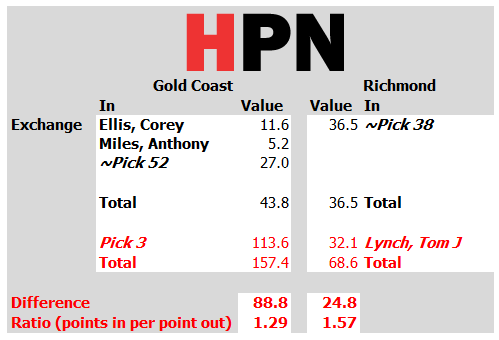 For Richmond, Tom Lynch, even with our bearish projection, more than balances out the loss of the fringe players Ellis and Miles. Even though he probably gives less than pick 3 will in total, the Tigers were never getting pick 3, and they’ll be most interested in the immediate payoff of making their side better in the next couple of years. Next Post:What value does an undrafted mature age player have?